“We aren’t just asking for money. We are asking for what is needed. This disaster has been unprecedented,” said one official. WASHINGTON — Puerto Rico Gov. Ricardo Rosselló and other island officials are asking Congress for nearly $95 billion in aid to help the island continue to recover from Hurricane Maria, which devastated the U.S. territory and has more than 60 percent of its residents still without electricity nearly two months after the storm. So far, Congress has approved almost $5 billion in aid for the island — largely loans — and island officials say much more is needed. “We aren’t just asking for money. We are asking for what is needed. 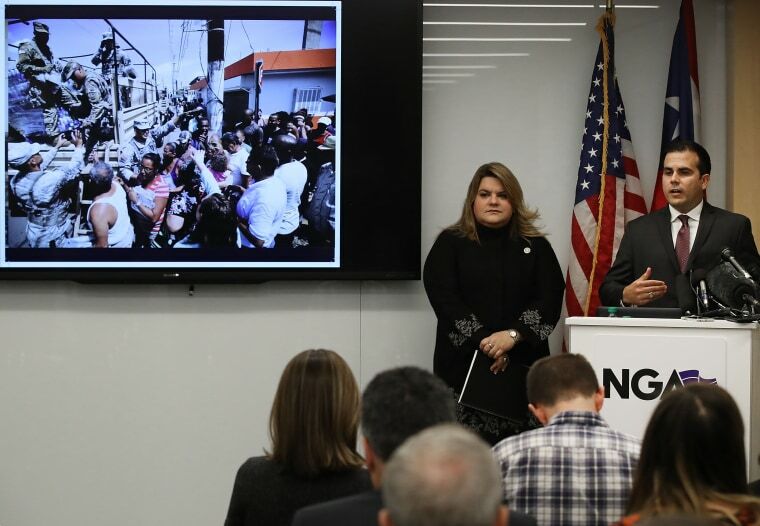 This disaster has been unprecedented,” Jenniffer González, the island’s nonvoting representative in Congress, said Monday at a news conference in Washington. The $94.4 billion request mirrors the amount Rosselló mentioned in a letter to members of Congress last month where he outlined what he said were “independent damage assessments” of the funds needed to restore and rebuild, including housing and the island’s infrastructure, in particular its electric grid. Island officials are asking that Congress consider several changes to the Stafford Act, which details federal natural disaster assistance for state and local jurisdictions. The Act specifies that critical infrastructure, such as electricity, be restored to its pre-disaster mode, but the Puerto Rico government considers their utility system to be outmoded and want to rebuild it, rather than restore it. González, along with Rep. José Serrano, D-N.Y., last week introduced a bill that would allow Stafford Act relief funds to be used to construct a ­modernized and more efficient electrical grid. Island lawmakers are also lobbying Congress ahead of a vote on the GOP tax plan — the Senate Finance Committee on Monday began marking up its version — with a particular look at a House proposal that would impose a 20 percent import tax on products manufactured abroad, which would affect Puerto Rico, as the IRS considers the island to be a foreign jurisdiction. “Puerto Rico is in the unique position of being a U.S. jurisdiction with 3.4 million U.S. citizens, while being considered international for tax purposes. If Congress doesn’t make an exception for Puerto Rico and the territories, they will be putting the final nail on the coffin of the Puerto Rican economy,” said Federico de Jesús, principal at the Washington-based FDJ Solutions and a former deputy director of the Puerto Rico Federal Affairs Administration, which represents the island government’s interests in the mainland U.S. While island officials were in the nation’s capital, a federal judge in New York rejected the island’s fiscal control board appointment of Noél Zamot to be the chief transformation officer (CTO) for Puerto Rico’s electric company, where he would in effect act as a CEO and oversee the utility’s recovery efforts. Both the Puerto Rico Electric Power Authority (PREPA) and Rosselló were adamantly opposed to Zamot’s appointment, and several decried his $350,000 salary as excessive on an island experiencing severe economic woes and for an agency that already has a director. The Puerto Rico Senate last week also rejected Zamot’s appointment, which came after a controversy over PREPA's contract with Whitefish, a small Montana-based company, ended with the contract being canceled. Congress continues to investigate the federal and island government response to Hurricane Maria in Puerto Rico — including the Whitefish contract — and Rosselló is expected to be among those testifying Tuesday afternoon before the House Natural Resources Committee.